This pub is named after the boy hero of the Newport Dock Disaster of July 1909. At that time, the Young Men’s Christian Association building was under construction – now the main part of the Tom Toya Lewis pub. The building cost £8,000 and was opened in November 1909 by Lord Tredegar. 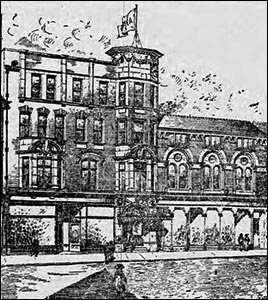 The 1909 drawing, on the right, shows the building’s distinctive tower rising above the ornate entrance. The YMCA was founded in London in 1844 to provide facilities where working men could meet for prayer and Bible studies. Newport’s YMCA was intended to help “bring in a large class of persons … not easily reached through ordinary Church agencies”. At the time, the population at this end of Newport was growing with the expansion of the docks. The South Dock had been extended in 1907 but ships still had to pass through the old entrance from the river Usk. Work began on a new entrance, the Great Sea Lock (or South Lock), so that ships could enter from the Bristol Channel directly. Workers dug a deep trench so that the lock’s west wall could be constructed. 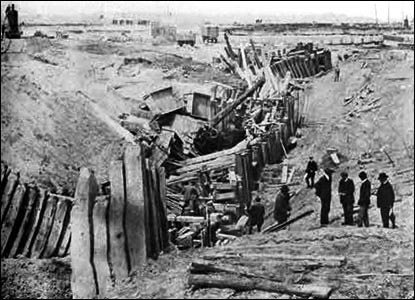 The sides of the trench were supported with timbers, which collapsed on the afternoon of 2 July 1909. The fall of wood, earth and rock buried 46 men. Only seven of them survived. The dead are commemorated on a memorial in St Mark's Church, Gold Tops. The photo on the left shows the scene two days after the collapse. Tom Toya Lewis (pictured left), a 14-year-old newspaper delivery boy, was among the crowd which gathered at the scene. He volunteered to descend through a narrow opening to try to free a workman called Fred Bardill. Despite the obvious instability of the wreckage around him, Tom worked for two hours, head down and 10 metres below ground, with hand tools to try to release Fred. He had freed one of Fred’s hands before there was a further slide of earth and officials insisted he return to the surface. Fred was released the following day. The photo shows the scene two days after the collapse. 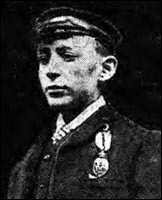 Tom received the Albert Medal, Britain’s highest award for peacetime gallantry, from King Edward VII at Buckingham Palace in December 1909. A newspaper reported that Tom seemed “somewhat abashed by the splendour of his surroundings”. His father said he was a “rare young rascal, and if any spree was going on he was certain to be at the head of it”. The photo on the right shows him with his medal. A local fund-raising effort secured several hundred pounds to send him to Rosyth naval base, Scotland, as an engineering apprentice. The Carnegie Hero Fund contributed £50.